Should I do an Online CPR course? What are the options and which one is the best? Here is the run down on the good and not so good for each option. For: They are very convenient. You can take them anywhere at any time. The online CPR classes are shorter, you can usually complete them in under 2 hrs but some claim they can teach you in as little as 20 minutes. You can be certified right there online and even print out your wall certificate and wallet card if you like, they are usually good for 2 years. You can take the exam as many times as you like in order to pass. There has been a lot of evidence that multimedia online CPR and first aid courses are very effective at teaching first aid and CPR. Companies and large organisations find the online approach very useful as it allows them to save costs and let the employee learn around their work commitments. Against: If you have no first aid experience at all an online CPR and first aid class may not give you the confidence you need to handle yourself in an emergency situation. There is something to be said for hands on experience. When it comes to saving a life nothing beats learning with an instructor, asking questions, using the props and tools and getting a feel for what a real life situation might be like. Be careful of the wording they use. If you need to be accredited make sure that is what they are offering. Websites may say that they follow American Heart Association guidelines or whichever association in your country that sets the accreditation standards. Then they may say you can print a certificate online. Just because you have a certificate does not mean you are accredited, it just means you have a lovely wall hanging for your house and your wallet. If you are taking online CPR and first aid classes just so you can be prepared (good for you!) it may not matter if you are certified. But if you are a healthcare provider or required to be accredited for your work situation then be sure to read the fine print. How long do you have to complete the course? Does the time work with your schedule? What if you need to extend the time allowed will they charge you more? Most sites give you a time window in which to complete the course, 3 days seems to be the average. Do you have access to the course online or printed material after the class? You did pay for it after all and you might want to brush up on your skills six months from now. Whose guidelines are they following. Is it an organisation I recognise like the American Heart Association, Red Cross or St John Ambulance? Are they using tricky language or does the website seem flashy or fake in anyway? Do they say you can print a certificate but refuse to say that you're accredited or certified? Do they say they follow standard first aid guidelines but won't say which organisation? Who can you call or talk to if you have a first aid question? Will they keep track of your certification and when it needs to be renewed or do you have to remember? Can you get a refund if you did not find the course satisfactory or found it incomplete? Look for hidden fees. Sometimes they charge you $24 for the course and then charge you extra if you want to be certified. cprtoday.com - No nonsense to the point, professional. We like them. They also offer 30 day access to the course. Professional Training Institute.net - They offer 6 months to view the course online and are very reasonably priced. Accredited. firstaidweb.com - You can take the course before you pay. So, if you don't need to be certified it's free online CPR and first aid training. Wonderful. American Red Cross - Your local Red Cross may offer online and blended courses. At the top of Red Cross homepage enter your zip code to find your local chapter. Not all locations offer it. For: They have stood the test of time. You get hands on training. You can work with an instructor and get your questions answered. Working with props and with other people more closely mimics a real life emergency giving you valuable experience. In emergencies we tend to freeze or panic so having performed the movements before in a classroom situation can reduce your anxiety and make you more effective. Against: The classes are longer averaging about 4 to 5 hours. Though shorter classes are now being offered. You have to find a location and get there. Though they try to make the scheduling convenient you are still subject to their timing. You are exposed to the information just once, and retaining all that information at one sitting can be difficult. You're given hand outs but 5 hours is a long time to stay alert. Within America there are two big players in this category and they are the very best so why go anywhere else. American Red Cross - They've been doing it for over 100 years. They know their stuff. Click on the link at the top of the homepage and enter your zip code to find your local Red Cross chapter. Find the link that says 'Take a Class" or "learn CPR". Beyond first aid CPR the Red Cross also offers a host of other courses including babysitter's training, emergency preparedness, lifeguard and water safety and HIV/AIDS education. America Heart Association - This is the American Heart Association. Click on the link and enter your zip code. The AHA will give a list of classes offered in your area at local hospitals, fire stations, CPR groups or community organisations. Just call to register for a class, prices vary depending on the organisation. Australian Red Cross - Again they offer a complete range of high-quality, accredited first aid courses. Both traditional and blended. Their website is extensive. St John Ambulance Australia - With over 100 years experience in first aid training St John is one of Australia's leading providers of first aid training with nearly 400,000 participants annually. St John Ambulance is a Recognised Training Organisation and issues nationally recognised qualifications and statements of attainment. British Red Cross - Red Cross believes that with training everyone should be able to save someone's life in an emergency. They offer many courses to back up their belief in saving lives. They are part of the world’s largest humanitarian organisation and are a registered UK charity. All the operating surplus goes into the Red Cross Charity Fund to care for those in crisis, both at home and overseas. This is a good reason to use them as your training partner. St John Ambulance - UK - St John Ambulance taught about 800,000 people first aid last year alone – this training can be the difference between a life lost and a life saved. They have multiple courses running in main locations. On their website they have a location finder. Just type in your postcode or town name. 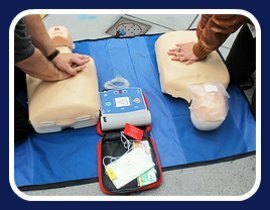 A blended course is online CPR and first aid classes that are then reinforced with an on-location training class run by an instructor. For: You get the best of both worlds. 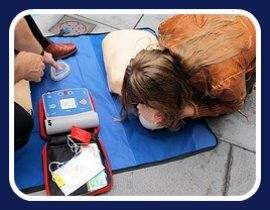 The convenience and speed of an online CPR and first aid course with the hands on training traditional classes provide. You can learn at your own pace. You can go back and review material that might not have sunk in the first time. Most websites allow you access to the course for months or even up to a year. The multi-media approach engages you with sight, sound, video and graphics making learning more comprehensive, faster with better retention (it beats sitting down with a dull pamphlet). The on-location training gives you hands on experience and the instructor can answer any questions that might arise. The corporate world likes the blended approach allowing their employees to learn at their own pace and then reinforcing that learning with a traditional class. It is also more cost effective if you have large groups of people to train. Against: Not many to be honest. You need to schedule a class with an instructor. If you are in a remote location this might not be convenient. EmergencyUniversity.com - These guys have done it right. They offer a wide selection of classes. They offer free refresher courses and re-certification. You have access to the course material for 1 year. They keep track of all your classes and when they need to be renewed send you an email for your refresher course or re-certification. If you are an individual this may not be so important but if you run a company with 100 employees knowing who has taken what can be a real time saver. They will also mail certification information to the appropriate organisations when applicable. Now that's service. 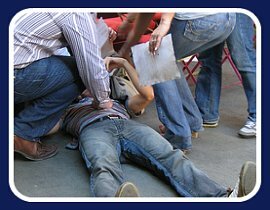 International CPR Institute - This is also an excellent site. They offer good value for the money. They give you 3 days to complete your course which is plenty of time. It doesn't look like you have access to the online CPR and first aid course after you have completed it, which may or may not be a problem for you. American Red Cross - Some Red Cross locations now offer both blended and online CPR and first aid classes. Just enter your zip code on the Red Cross homepage to find your local chapter.